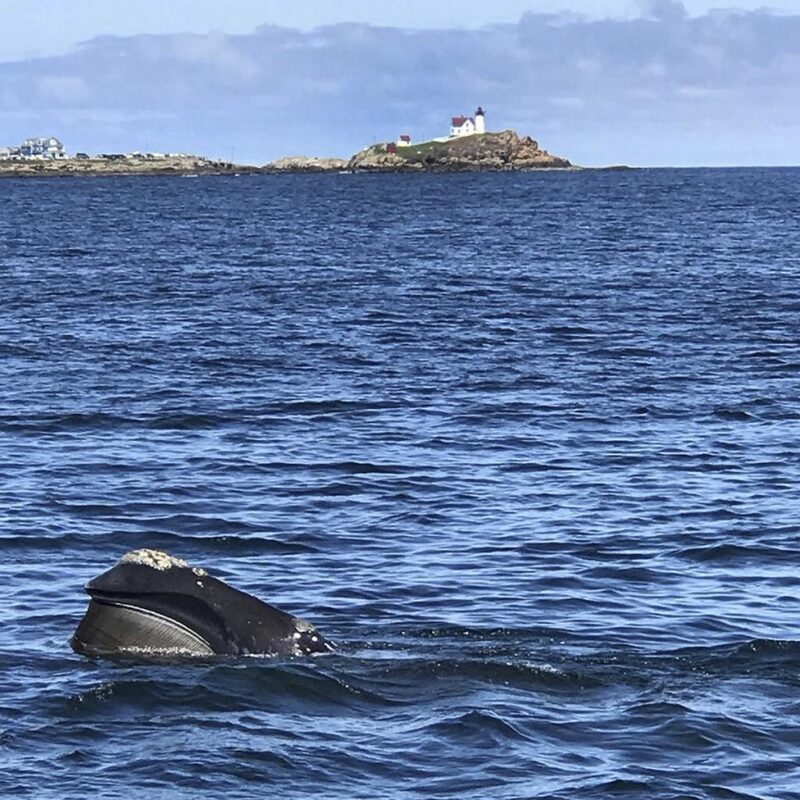 At least one North Atlantic right whale has been seen swimming near the coast of York County in the past few days, providing some Mainers with a glimpse of one of the rarest large whales in the world. Wells police issued alerts warning boaters to stay clear and not to interfere with the whale, which appeared to be taking a meal break on its slow migration north to Canadian waters. Cressey, of York, said he and the others on board realized they should stay clear of the animal, even though they didn’t immediately know it was a federally protected right whale. Cressey zoomed in with his smartphone to photograph the whale as it fed on the surface with Nubble Light in the background. He estimated the whale to be about 30 feet long, which would make it a juvenile. Adults can grow to twice that size. The York Police Department received numerous reports over the weekend of whales seen from shore swimming in the area near the Drakes Island Jetty and Wells Beach. The whales were observed as they swam along the surface, likely feeding on small copepods. People also reported seeing whales off Ogunquit and York. Scientists from the New England Aquarium were seeking photos of the whale – or whales – to try to identify the individual animals, said Tony LaCasse, spokesman for the aquarium, which catalogs all right whale sightings. He said it’s uncommon, but not unheard of, to see right whales along the southern coast of Maine as they work their way north from spring feeding grounds in Cape Cod Bay. North Atlantic right whales, so named because they were the “right” whale to hunt, are among Earth’s most endangered species. They were almost hunted to extinction by whalers, who prized their size and oil-rich blubber. About 430 North Atlantic right whales remain, including just over 100 breeding females, according to The Washington Post. In the past 11 months, 18 whales have been found dead. Scientists believe the right whale population will not be viable within 25 years unless something changes. For the first time on record, no right whale calves were born this winter, LaCasse said. In past years, between 15 and 23 new calves have been reported. Juvenile right whales were once known for swimming near the coast and around the mouths of rivers, although such sightings have become rare in recent decades because there are so few of the animals left in the Atlantic Ocean. A juvenile right whale caused a similar stir in 2000 when it swam into Portland Harbor. The species is so critically endangered that each individual whale has been identified and tracked by researchers. They do that using the white, raised skin pattern on the top of their heads. The pattern is as unique as a fingerprint, and researchers are able to build an individual biography of each whale based on where it is spotted, LaCasse said. Researchers from the aquarium have been especially busy studying right whales in the past several weeks as they congregate off Cape Ann in Massachusetts to feed on the copepods, a fatty animal plankton about the size of a piece of rice. The whales use their baleen to filter the plankton from just below the surface of the water. The feeding season began late this year, although scientists do not yet know the reason. About 145 right whales were recorded in Cape Cod Bay this spring. Last week, a couple of dozen whales were spotted around Marblehead, Massachusetts. Typically, feeding activity is centered around the eastern and central part of Cape Cod Bay, but this year whales also are feeding on the western side of the bay. Some have been seen in Boston Harbor in the past three weeks, LaCasse said. “It almost looked like a picket line of whales from Boston’s south shore to the mouth of Boston Harbor,” he said. After feeding in Cape Cod Bay, right whales disperse and some head north toward the Bay of Fundy between Down East Maine and New Brunswick. Some years, more than half the population of right whales has shown up looking to feed, but in the past five years the copepod food supply has been missing from that area, LaCasse said. The absence of the plankton has prompted some right whales to head to the Gulf of St. Lawrence in Canada, where LaCasse said protections for whales are not as strong as they are in the United States. From June to September 2017, 12 North Atlantic right whales died in the Gulf of St. Lawrence. In posting their warnings to stay away from the right whales, Wells police reminded boaters that the animals are federally protected. “While it is quite an incredible sight to see, we remind everyone that it is a federal law to not harass or approach any marine mammals,” police said. People are required to stay at least 1,500 feet away from right whales, said LaCasse, who praised Wells police for spreading the message about staying clear of the animals. Right whales can grow to more than 50 feet and weigh up to 70 tons. “We have just been lucky enough to be able to experience them from shore!” police said in a Facebook post that has drawn hundreds of reactions, shares and comments. Cressey, the service manager at York Harbor Marine, was out for a cruise with a few other people, including his wife, when they got the rare close-up view. Earlier in the trip they had seen a more common minke whale, as well as what he believes were dolphins. But the right whale sighting was special. “I (had) never see a right whale,” he said. The New England Aquarium is asking anyone with photos of right whales to send them to [email protected] or fill out the form at https://form.jotform.com/62625096321150. People who spot whales can also report them immediately by marine VHF via Ch. 16 to the Coast Guard; to the National Marine Fisheries Service hot- line at 866-755-6622; or via the Whale Alert app.